What better way to declare ones love than to write the names on a padlock, lock it and throw the key in the river, forever binding each others soul until the end of time?? This phenomena first started in Paris in the early 2000's. There are two main theories of its origins. The first hails all the way from Mount Huang, also known as the Yellow Mountain in Huángshān, China. 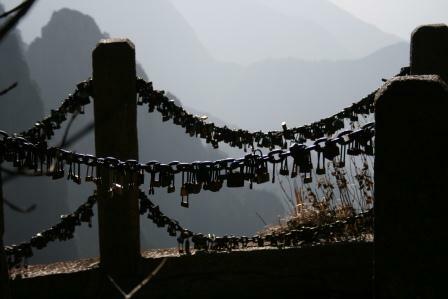 The surrounding fence is now a landscape of its own made up of padlocks locked there by fierce lovers who pledge to each other eternal attachment and together throw the key into the mist. However, things can get a little awkward should they happen to break up; according to the custom, souls can only be freed when the key is retrieved and unlocks the fitting padlock. fun times. The second theory comes from Italy. 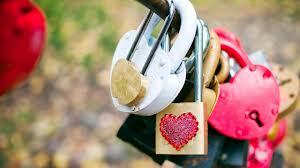 The padlocks are more than likely inspired by a scene from the 2006 book " I want You" by Fernando Moccia. The protagonists seal their love with a padlock locked to a lampost on the Ponte Milvio bridge and throw the key into theTiber River. Later that year, said lampost collapses under the weight of all the padlocks. In keeping with the romanticism, the Mayor of Rome added lamposts to the Ponte Milvio! awww. But only in Paris should there be not one HUGE love locks bridge, but TWO! The first one is at the beautiful bustling Pont des Arts. This outdoor artists studio is the perfect spot for lovers to come and declare their undying affinity. 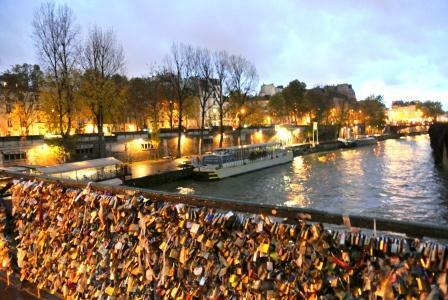 Again, the same custom applies here, the only way to break this seal of love should one need to, is to find the key ( at the bottom of the Seine) and unlock the padlock. Sadly, this is very rarely possible and in turn, crazed heartbroken individuals have been known to return with the bolt cutters. 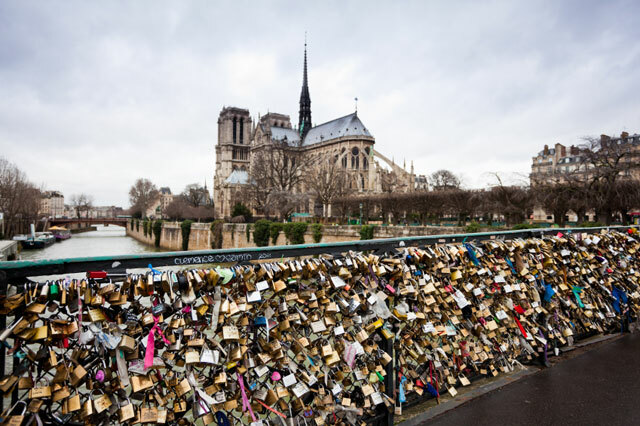 The government has tried to clamp down on this carry-on and tried to cut down the locks but love prevailed over politics and the locks came back in bigger and stronger force, taking over even another bridge! but this one has a little difference. The second bridge in Paris is the Pont de Archevêché. Now the difference between the two bridges. Something that maybe some people may not know and something you definitely want to know should you participate in the love locks craze. 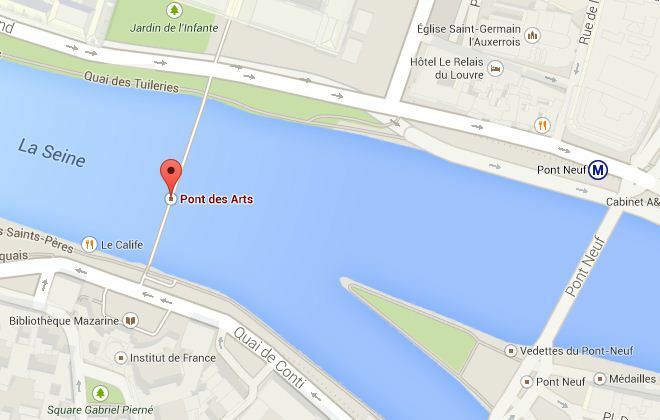 The Pont des Arts is reserved for your comitted love, your wife, your husband, your partner. 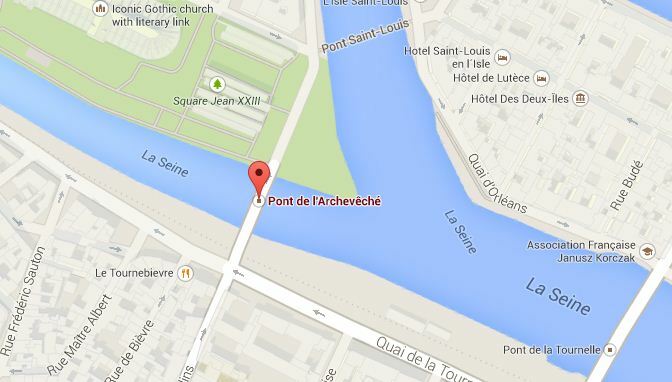 The Pont de l’archevêché is for your er, lover, concubine, bit on the side. VERY IMPORTANT to remember this when locking a padlock forever friends! 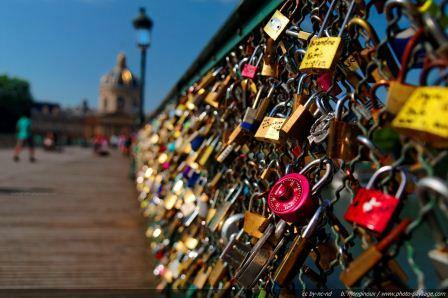 Curiously, the pont de l’archevêché is brimming with padlocks while the pont des arts is quite sparse in comparison. interesting. want to visit the bridges?